Just a few weeks ago a former red Tory quit the party claiming they were nothing more than a 'cult-like mafia'. But let's not focus on what a former red Tory has to say too much when we can instead focus on a current red Tory proving this claim to be correct. "We live in a democracy and anyone with £500 can stand as a candidate". Those are the words of the regional spokesperson for the Welsh branch of the Englandandwales Green Party. A branch who believe it is better to stand paper candidates all over Wales than send as many anti-austerity MPs to London. 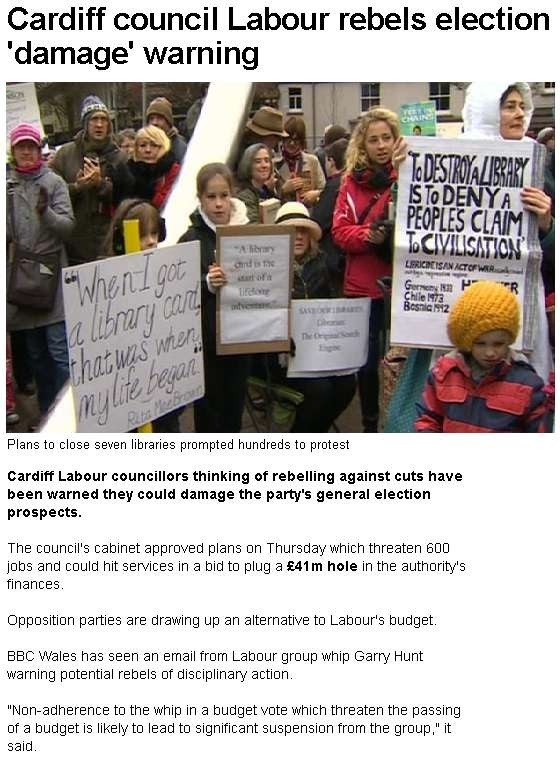 The anti-austerity bloc comprises a loose partnership between the SNP, Plaid and the Englandandwales Greens. A recent spat appears to have emerged in Ceredigion where Plaid and the Greens once teamed up to win the seat back in the 90s. With the current incumbant being a Lib Dem the election in May represents a great opportunity for Plaid to win another seat. They already hold three and if they can keep these then anything extra in winnable seats like Ceredigion, Ynys Mon and Llanelli is a bonus. The following is an extract from Pippa's latest whinge where she accuses Plaid leader Leanne Wood of asking, maybe even demanding that they stand down in Ceredigion. 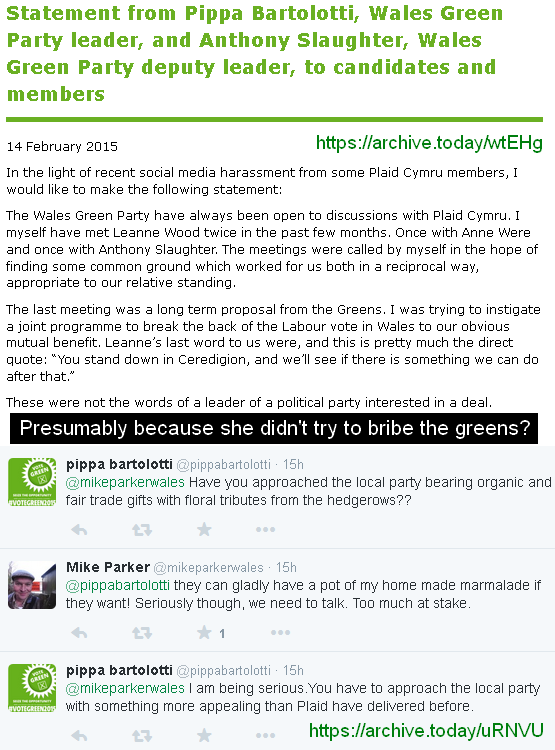 I've also added an extract from a twitter exchange between the Plaid candidate, Mike Parker and Princess Pippa. I have archived both extracts here and here. Now asking, or even demanding that the Greens stand down in Ceredigion might be a big deal if the Greens had a hope in hell of winning the seat. In 2010 the Green candidate came last with less than 2% of the vote with Plaid coming second with over 28%. Given how badly the Lib Dems are performing after getting into bed with the blue Tories you'd have to be brave to think they will get anywhere near the same support this time. I've taken a look at the latest odds in Ceredigion and they are quite bad if you are a Green but quite good if you are Mike Parker the Plaid candidate. So here's what they could do, they could offer the Greens another chance to stand down in Ceredigion on the proviso that Plaid would in turn stand down in Newport West (where Pippa is standing). That's Paul Flynn's fiefdom and since he is currently 1/100 on and both Plaid and the Greens are both 100/1 it's a no brainer. Whilst he is a red Tory he is probably the least awful red Tory here in Wales. The only downside for Pippa is that she will still come last, albeit in a reduced field. But why should they when hopefully Simon and his team can trounce Pippa in her own adopted backyard. The Welsh branch of the Englandandwales Green Party are clearly more interested in satisfying Pippa's narcissism than in sending anti-austerity MPs to London. The biggest irony of all is that the Greens are the one BritNat party that would actually be better off if they took their orders directly from Green HQ in England. Princess Pippa's latest cry for attention has been picked up by the EBC where they are accusing Plaid members of 'bulling' the Greens, I presume they mean bullying. For the record I am not a member of any political party but I do believe that an anti-austerity alliance could ensure that the London parties are put in their place. This should also lead you to ask if Pippa and her merry band of paper candidates cannot accept a few words on the internet then what the hell would they be like if the people of Newport West and the rest of Wales actually voted for them. On her blog she says that "the Greens do not split the vote, the voters do". To me that's reminiscent of the American gun lovers the NRA when they say that "guns don't kill people, people do". Anyway, I wish the Greens in England the best of luck in May but the Greens in Wales are just one person's ego trip and I really hope she and her army of paper candidates lose their £500. If you wish to follow Mike Parker's campaign in Ceredigion you can do so via his twitter or facebook pages or via the handy plug ins I've added below. Once again, for those who didn't understand it the first time I said it I am not a member of any political party but I'm all for spreading the anti-austerity message. Scumbag Labour - A Fracking Bribe! Labour have unveiled their latest batch of jam tomorrow. This weeks batch of jam tomorrow is about fracking. 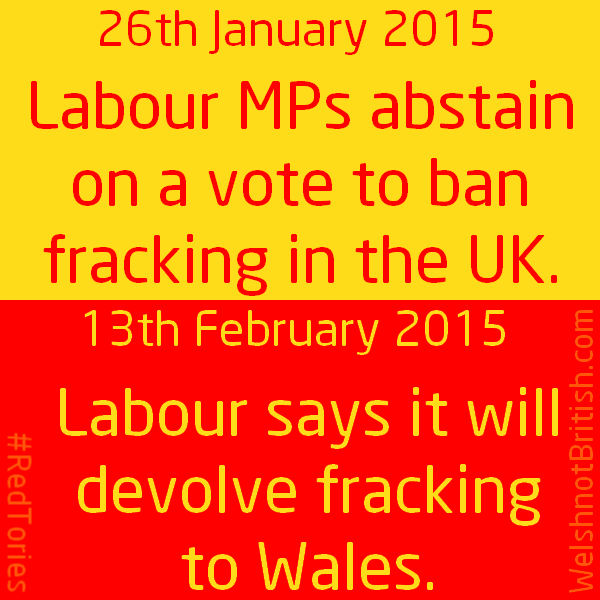 Apparently if people are gullible enough to vote for Labour then they will devolve fracking to Wales. Real life troll and supporter of Welsh apartheid, Peter Hain recently sat on his hands and did nothing whilst the rest of his mates in Labour voted for the Tories bill to make an extra £30 billion worth of cuts. Despite abstaining (a cowards way out) he then started mouthing off about how bad austerity was to anyone in the London controlled Labour supporting media that would listen to him. 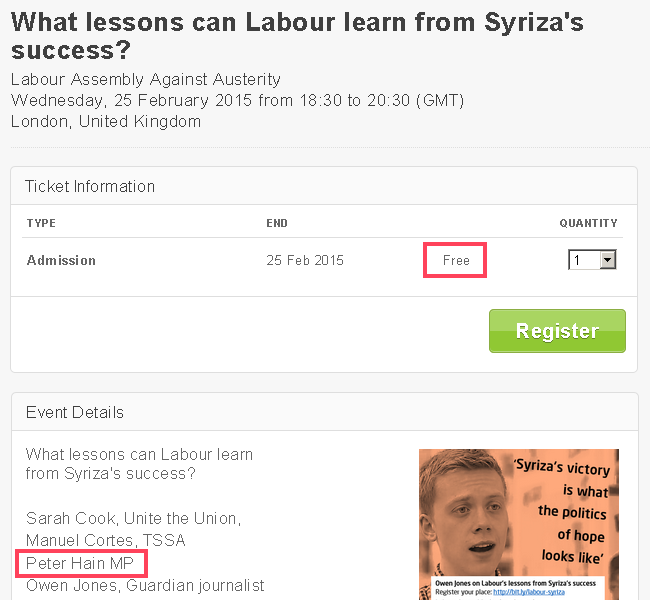 But it gets even better, now the scumbag is planning on speaking at an anti-austerity event. It shouldn't suprise you that he has a book coming out. After all he was trying to drum up sales of his Mandela books whilst his friend was on his death bed. Whilst looking up Colwyn Bay's born Monty Python member Terry Jones, I came across his 'Great Map Mystery'. In this four part series he traces the roads shown in John Ogilby's 'Britannia', the world's first road atlas. The first episode sees Terry travelling on the road to Aberystwyth. Although in the episode we learn it's more likely a road from Aberystwyth as it highlights the silver mines that funded the military of the time. 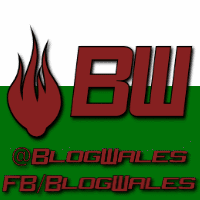 The show was made by the EBC so you have to expect an Anglicisation of Welsh history. Based on the strength of episode one I have downloaded all four from youtube and will watch them all in due course. In the meantime I will share them here for those, like me, who missed them the first time around.